Of the menisci within the knee, it is the medial that is more easily injured. Differences in the anatomical attachments of the medial meniscus compared to the lateral mean that the medial meniscus becomes distorted during combined flexion and rotation movements in a manner not experienced on the lateral side. Medial meniscal injuries are usually considered as either traumatic or degenerative. While degenerate tears may present with a gradual history of increasing symptoms, traumatic injuries will usually occur as the knee is extended and rotated from a flexed position against resistance. This may occur as a single event during a sporting endeavor or during a period of unaccustomed squatting such as laying flooring or playing with children. The most commonly injured area is the posterior horn. 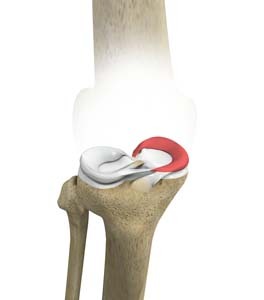 Locking : The inability to extend the affected knee to the same extent as the contra-lateral side. Crucially this is due to a mechanical block and while pain may be a feature it is not the sole reason the knee is unable to extend. This presentation is caused by a bucket handle tear (an unstable vertical longitudinal tear) prolapsing out of position creating the mechanical block to movement. Pain : This is characteristically intermittent in nature and associated with activities such as stair climbing or running. Patients will often complain of an inability to fully squat. Patients will also exhibit tenderness along the joint line of the affected knee. Swelling : In large peripheral tears the injury may be associated with a post-traumatic effusion. More commonly, the irritation caused by the damaged meniscus causes recurrent effusions associated with exacerbations of the symptoms. A 3rd form of swelling is the localized meniscal cyst caused by a complex meniscal tear acting as a flap valve to synovial fluid leading to the gradual formation of a para-meniscal cyst that may be apparent clinically. Clicking : Patients will often complain of, and sometimes be able to reproduce clicking. This is a palpable demonstration of the ongoing damage that is being caused by the displaced meniscal fragment. The description patients find most easy to understand is of a broken tooth within a gear box jamming the machinery. Medial meniscal injuries are diagnosed using X-ray, ultrasound, CT and MRI scans. In cases where a meniscal injury is associated with degenerative change within the knee, it may be difficult to ascertain which pathology is causing most the symptoms. In such cases an unwise intervention may lead to a perceived deterioration in knee function and the torn meniscus may be best left in situ. This is the most commonly performed treatment option and provides excellent, long term symptom relief for most patients. Although most patients will experience improvement within a few weeks of surgery some may require longer periods due to extensive quadriceps atrophy or other intra-articular pathology. In certain, specific cases the meniscus may be able to be repaired. This is usually restricted to those cases where a fresh, peripheral tear is identified at arthroscopy in a young patient. The limited application for meniscal repair is due to the poor blood supply found within most the meniscus, meaning only the outer 25% has a viable healing potential. It is an important consideration for many patients that a meniscal repair will necessitate a much-prolonged period of rehabilitation when compared to a simple excision. Most the literature regarding prognosis following meniscal excision dates from the pre-arthroscopic era of total open meniscectomy. As such there is a commonly held perception that excision results in arthritis. This is overly pessimistic. Having a meniscal tear is a significant injury to the knee. Ongoing mechanical symptoms indicate ongoing damage to the chondral surfaces of the joint. If an arthroscopic excision is performed before extensive chondral injury has been sustained, many patients do not develop problematic osteoarthritis and will experience long term symptom relief.